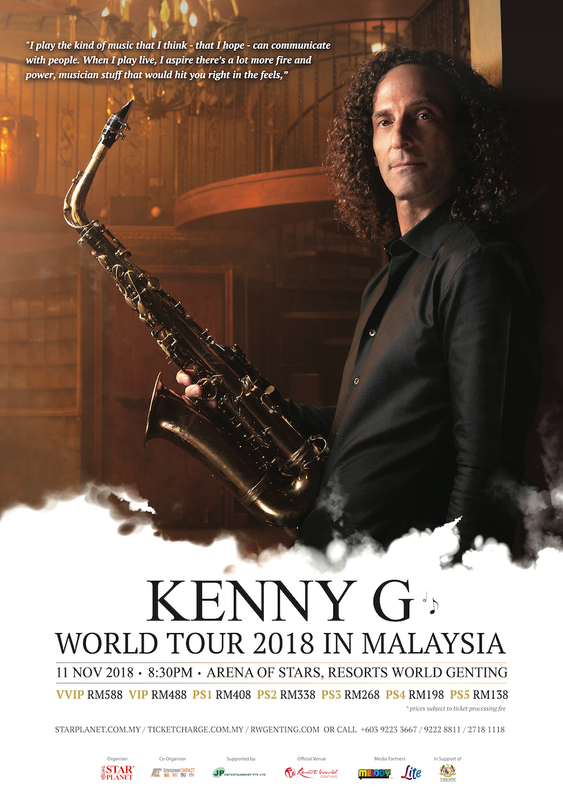 Resorts World Genting will once again be welcoming Grammy Award-winning saxophonist Kenny G as he embarks on his world tour and stops by the Malaysian resort for a one-night only show. Tickets for the show are priced at RM588 (VVIP), RM488 (VIP), RM408 (PS1), RM338 (PS2), RM268 (PS3), RM198 (PS4) and RM138 (PS5), all excluding ticket processing fee. Ticket sales will commence this 15 August (Wednesday) at 11am. Booking can be made via call (Star Planet 03-92233667 / TicketCharge 92228811 / Genting 27181118) or online (www.starplanet.com.my / www.ticketcharge.com.my / www.rwgenting.com). The first 1000 VVIP-PS4 tickets purchased via Star Planet or TicketCharge will get a 15% Early Bird discount. Star Planet members will also earn 1x Reward Point for every RM1 spent on tickets. As for GRC members, 10% standard discount will be offered when purchasing VIP-PS4 tickets via Genting Point Redemption and 5% discount if purchased using cash or credit card. Tickets must be transacted via Genting Sales Offices to be eligible for discount. will be filling the air at Genting this November. This is Kenny G’s third time performing at Genting. He had previously performed full-house shows in 2012 and 2015. Well known for his smooth saxophone sound, Kenny G has sold over 75 million copies worldwide in the past three decades. His song “Forever in Love” won him a Grammy Award for Best Instrumental Composition in 1994. He has also been nominated for 16 Grammys. So far Malaysia and Jakarta (6 November 2018) are the only venues for this tour that will be held outside of the United States, where Kenny G is currently touring until this December.